Plant clinics are opportunities for members of the public to get help and information for solving gardening problems. 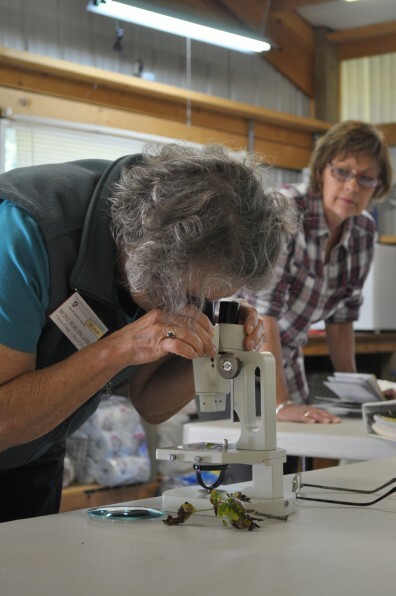 If you would like a plant or insect identified or a disease diagnosis, bring as much information to the plant clinic as possible, including plant samples or photographs. During the winter, plant problems can be brought into the Extension Office in the Clallam County Courthouse, Monday through Thrusday, 9 AM to 2 PM. Also, plant clinic questions can be submitted to us at mgplantclinic.clallam@gmail.com or you can call the Master Gardener Help Line anytime of the year: 360-417-2514. Is it getting noticeably worse? Is more than one plant affected? How often is the plant fertilized? Fertilizer strength? Have any chemicals been applied near the plant recently? Have the roots been disturbed? Bark damage? Is your plant turning brown or the edges curling? Does it have black spots or is it turning yellow mid-summer? Does your lawn have discolored rings? We can help you identify the likely problem and suggest solutions to restore your plant, lawn or garden to good health. When you bring in a sample of a damaged leaf or branch, we can examine it and offer control measures according to recommendations from WSU Extension. We’ll also explain which flying insects are your garden’s best friends and which are its foes. Do you want to learn more about drought-tolerant plants suitable for our area, fire-wise options, the benefits of drip irrigation, which mulch to use, the best time to fertilize or water your plants, or how to prune your roses, shrubs and trees? Master Gardeners have experience and technical resources to answer your questions. Apple, cherry and pear production is a major industry in our area. Learn why to buy these fruits locally rather than grow your own. If you grow these trees, learn which sprays to use and when to apply them to avoid problems that could endanger the local fruit industry.